Skoda has launched their only SUV in the Indian market in the form of Kodiaq. The SUV is available in only one variant, and it is priced at – 34.49 lakh, ex-showroom. The Skoda Kodiaq will compete with the likes of Ford Endeavour and Toyota Fortuner in the market. Top-end variants of the Fortuner and Endeavour are priced at around 31 lakhs, nearly 3 lakhs cheaper than the new Skoda. The Skoda is based on the MQB platform, the same platform that also underpins the Volkswagen Tiguan. The seven-seater SUV is longer and taller than the Tiguan. The Kodiaq boasts of a 187 mm of ground clearance. The Kodiaq looks extremely modern with full LED headlamps and LED DRLs. The car gets deep creases on all over the body. The car gets panoramic sunroof that extends to the rear seats. The Kodiaq looks very premium with 18-inch alloy wheels and blacked out roof rails. At the rear, the car gets C-shape LED tail lamps. The exterior is inspired by the Czech crystal, which gives it a very eye-catchy look. 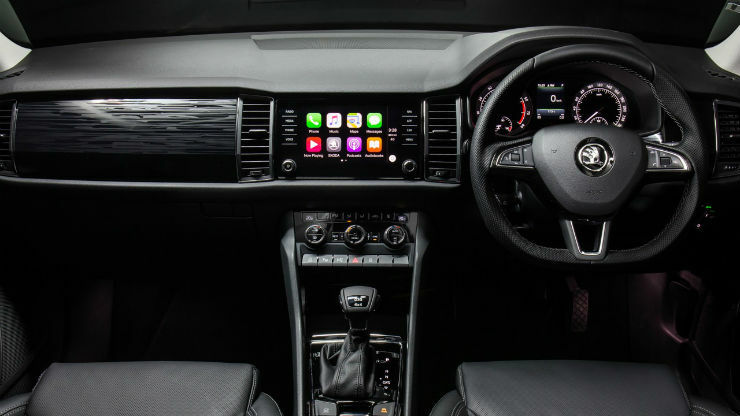 On the inside, the Kodiaq gets 8-inch capacitive touchscreen system with Apple CarPlay and Android Auto. It also gets LED ambient lights, hands-free park assist, electric sunroof and leather seats. Skoda also debuts a new dashboard design for all the future Skoda SUVs with the Kodiaq. Other features include Wi-Fi, Google Earth, 360-degree cameras, hands-free tailgate operation, emergency SOS function. The car also comes with smart features like a magnetic flashlight, protective rubber beading that pops out when the door opens, and umbrella holder on the door. The Skoda Kodiaq comes with a lot of space inside. The car gets 270-litre of boot space with all rows in place. With the last row folded down, space jumps to 630 litres and with the second row folded down, space becomes 2,005 litres. The engine is a 2.0-litre diesel TDI engine that develops a maximum power of 150 Bhp and 340 Nm of peak torque. The engine is mated to a 7-speed dual-clutch automatic transmission that sends the power to all the four wheels. The ARAI certified fuel efficiency is 16.25 km/l. There are only one engine and one transmission option. Skoda has started taking the bookings for the vehicle, and the deliveries will start in the first week of November all through India.